Y 1/c James E. Fondren, son of Mr. and Mrs. Robert P. Fondren, attended Frederick High School; husband of the former Lucille Chandler. Entered the Navy in April, 1942, traiend in San Diego, Cal. 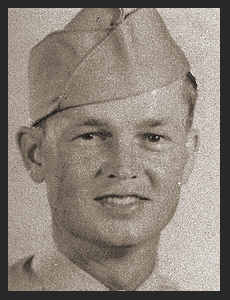 ; went overseas in July, 1943, served in Hawaii, Samoa, Fiji, New Caledonia, New Hebrides, New Georgia, the Russells, Treasury, the Solomons, the Marshalls, Saipan, Tinian; was discharged in Sept., 1945. Awarded Good Conduct Medal, Am. Theatre Ribbon, Asiatic Pacific Ribbon with four Battle Stars.